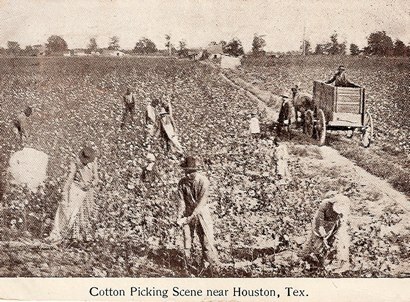 Cotton Production As It Once Was. Fifty years ago this August I drove from Boulder, Colorado, to Victoria, Texas, where I was employed as a teacher. After having spent the night in Hereford, I continued my trip south. At mid-morning near Plainview I came upon acres and acres of cotton plants on either side of the highway. It was not until I pulled over and turned off the ignition that I heard the relentless pulsing of the irrigation pumps in the fields. The sound suggested the sound of a giant heart buried under the soil of the high plains. Reflecting today on the sight of the cotton plants, I am reminded that one hundred years ago my father boarded a Cotton Belt train at Saltillo on his way to the cotton fields of West Texas. He traveled to Fort Worth and from there he took a train to Stamford. A third train took him to Spur on tracks that had just been laid. His purpose was to earn enough money during the harvest season to finance a modest business venture back home in Hopkins County. The railroad from Fort Worth to Stamford had existed only two years when my father made the trip. Magnus Swenson, a Swedish immigrant, was instrumental in getting the railroad constructed. Swenson owned many acres of land in the area. Two years after the Stamford road was completed, construction began on a railroad to Spur. Swenson began to sell town lots in the developing town of Spur. According to Jim Corder in Lost in West Texas, within thirty days after the railroad was completed the town had 30 businesses, 60 residences, a telephone system, and water works. Near Spur, my father picked cotton for a farmer of Swedish descent. It is possible that the farmer was one of several Swedes Swenson encouraged to emigrate to West Texas. My father shared a bunk house with several other Anglo pickers, most of whom also came from East Texas. The Mexican pickers lived in tents on the property. The farmer�s wife provided meals for my father and some of the other pickers. My father said that he picked cotton every day, even on Sundays. Most of the other pickers observed the Sabbath by going to the nearby towns of Afton and McAdoo where some played dominoes in the back rooms of general stores. In a game called Forty-two, two partners opposed two others. Probably money earned from picking cotton exchanged hands after some of these games ended. After the fluffy cotton had been picked, there was still cotton in the dried bolls that did not open fully. My father and some of the other pickers stayed late into the season in order to pull the bolls so that the machine at the gins could remove the lint. It is interesting to reflect on the difference between the production of cotton one hundred years ago and the time fifty years ago when I heard the irrigation pumps in the fields near Plainview. Instead of waiting for migrant laborers from East Texas and Mexico, those farmers fifty years ago readied their mechanical cotton pickers before the harvest season.